Motion Capture is a cutting-edge method of capturing all or part of an actor’s performance so that it can be translated into the action of a computer generated 3D character on screen. 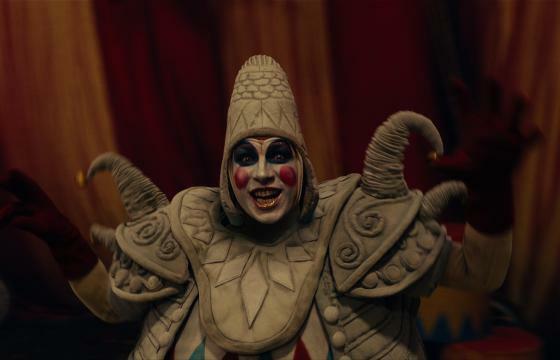 Because the exact movements of the actor are captured and rendered onto the digital character, it’s helpful to think of it as full-body digital make up; a collaborative process allowing filmmakers to imbue characters with incredible levels of subtlety and naturalism whilst placing no limits on the creativity of the visual appearance. This process has been very successfully employed in collaborating on extraordinary performances in films such as Avatar, Lord of the Rings and World War Z. The motion capture suit is designed to be a close fit due to the fact we need to place the markers as close to the performers key joints as possible. They are specifically designed with this in mind and are constructed from specialist material as a result of many design iterations. The optical markers are attached to the suit using hook velcro. The markers will then be further secured using coloured neoprene patches – these patches stop the markers from transferring to other parts of the body and/or other actors as well as helping us to distinguish between the actors on the screens and in post production. Images show examples of the mocap suit. There are between 60-65 markers on the body. The marker set or suit design may differ from images shown. Coloured stripes assist the technicians during post production. 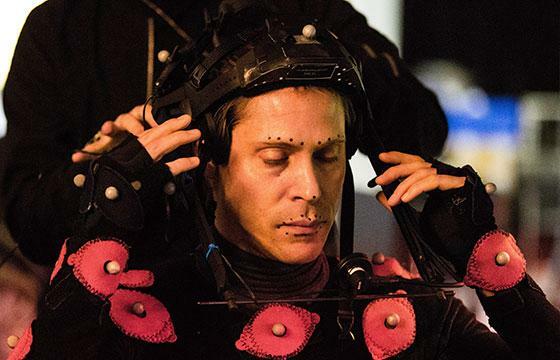 For Full Performance Capture or Face Capture, we may use the HMC or Head Mounted Camera to record facial expressions and / or dialogue to fully capture the intricacies of a performance. The HMC has between 1 – 4 cameras and make and model may vary. The capture space is called the ‘Volume’. This is essentially a studio stage over which is mounted around approx 60 motion capture cameras which will capture every detail of the performance, translating it to a character avatar in real-time. As with green screen work, the volume will be as bare as possible, with essential props or scenery represented by physical mock-ups. The floor is then divided by tape into a grid and will have visible position reference points marked out on the floor. Shooting Motion Capture can often feel strange or unusual if you are not familiar with it, even for seasoned professionals. Most actors and directors are used to working with large set pieces and complicated props. The minimalist nature of Motion Capture strikes a large contrast to traditional film methods. Appearance isn’t everything however, and despite not looking like a traditional set the scenes in Motion Capture can be performed largely as they would in conventional shooting. An advantage of motion capture is the ability to shoot scenes in their entirety, due to the cameras capturing from every angle. This gives the added benefit of removing the need to turn around and re-set for other angles – if the actors and directors are happy with the take then we have every angle and framing that anyone could need.